I was asked recently about the these verses with particular interest in the phrase "received not the promise". What was this promise and why would the scripture state that the Old Testament saints did not receive it? To answer this I will make my usual winding path through scriptural context in an effort to shed some light on it. To make an examination of the promises mentioned in our verse and why they might not have been received by the Old Testament saints it is necessary to identify what exactly they are. Most commentators I consulted suggested that the promises where the appearance of Christ. While the Old Testament saints had a faith in him and a promise of his appearance, they did not live to see it fulfilled. Instead they had to wait for the authors day for the fulfillment. At a surface level I do not dispute this interpretation, but I believe there is a much more important context to be considered with this text. Hebrews is a temple text from beginning to end. Its author was intimately familiar with the ritual and furniture of the sacred building and refers explicitly to its services throughout the text. This is essential to understanding the text. The author takes the reader on a journey through the sacred temple ritual and precincts in a symbolic journey to explain the higher covenant. In this it is important to understand that the Jerusalem Temple was central to the faith of Jews including the Jewish Christians. However as relations between Christians and mainstream Jews broke down, the presence of Christians at the temple became less welcome and Jewish Christians lost access to a valued symbol of their faith. The incorporation of Gentiles into the Christian faith only made this more problematic. It is also clear that Christians were developing a new body of ritual that was not entirely compatible with the temple cult. Information about early Christian rituals is fragmentary but it seems plausible that rituals would have used private structures rather than a formal temple where they were not welcome and where officiators rejected their doctrines. One of the recurring themes of Hebrews is that the Christian rites are both superior and acceptable even though they do not enjoy access to a physical temple. Many commentators have extended this into a general anti-temple position but as a Latter-day Saint I find such unwarranted and instead place these ideas in context of reassuring the early saints who had no means to build a temple. While there is a definite assertion in Hebrews that the ritual has eternal and spiritual aspects that transcend the physical building, there is no animosity in it to having a physical building. Chapter 1 bursts open with a grand view of creation, declaring the central role of Jesus Christ in the act and noting that he has gone beyond the angels to obtain a "more excellent name" at the right hand of God. Hebrews 2:1 enjoins the readers to give earnest heed to the teachings they have received lest they should "let them slip." In 2:10 the author explains that as Christ performed his proxy work on our behalf he became the "captain" of salvation. The Greek word here is ἀρχηγὸν archegon and gives a sense of "first leader". NIV renders the word "pioneer". The word occurs only four times in the New Testament and always refers to Christ. In Acts 3:15 and 5:31 it is rendered "prince". It also appears again in Hebrews at 12:2 where it is rendered "author". Also it states he was made "perfect". The Greek word here is τελειῶσαι teleiosai. This is a special word that also recurs in a slightly different form with archegon in 12:2. This word has forms as a verb as in this case teleioo, an adjective teleios, and a noun telos 3. It is believed to be from this word that Joseph Smith coined the word "telestial". The word signifies a complete or end state. It also can signify the idea of having come full circle such as a death before a rebirth into another state. The word however is even more interesting for its meaning of having been fully initiated, such as into a mystery. Given the heavy emphasis on the temple throughout Hebrews, this is likely the meaning intended here. One prominent example of this meaning of the word would be the Telesterion of the Eleusinian Mysteries. The Telesterion was an initiation hall where initiates after a lengthy procedure involving journeys, purification washings and sacrifices would enter the Telesterion where no one knows exactly what happened as it was closely guarded as secret but involved undergoing an ordeal of darkness and fire and a final recitation of a sacred phrase. I won't digress further in discussing these mysteries as the footnotes should link to adequate resources on them 4. I mention them merely to illustrate the meaning of this word "perfect". It is a state of having acquired special sacred knowledge through an initiation. Often this knowledge is acquired only after a great ordeal, one that is at least symbolically terrifying. This may involve the symbolic death of the initiate or a trial of darkness or fire as in the Eleusinian rites. I am reminded of the trial of fire and water Tamino must undergo in the Masonic opera The Magic Flute to join Sarastro's priesthood in the Temple of the Sun5. This terrifying trial is a recurring theme in many initiation rites. In our text it mentions specifically that Christ attained this state through his sufferings. Throughout this and surrounding verses the effects of Christ's proxy work in facing the ordeal on our behalf and his adoptive fraternal position allowing us to become his brothers and learn his name is emphasized. By 2:17 the temple aspects of the text start to become more explicit as Jesus is described as performing the role of the High Priest making reconciliation for his people. Of course in Judaism of this time the High Priest performed this role through various temple rituals and sacrifices, the crowning moment being the body of rituals of Yom Kippur or "Day of Atonement". His title is again given in 3:1 with the compound of "Apostle" and High Priest. This is the only time in scripture where the title of Apostle is applied to Christ. In 3:11 we find the first reference to the promise of "entering into my rest". It is repeated in 3:18, 4:1 (where it is explicitly referred to as the promise), 4:3, 4:5, and 4:10. And so the first sketches of the promise are outlined. It is clear Christ is the officiator on our behalf who will cleanse us and guide us to "his rest." As such his work and position are in every way superior to his counterpart in the Jerusalem Temple. Beginning in verse 4:1 the author introduces the theme of fear and the ordeal expected of the initiate. The failures of previous generations to enter the rest is emphasized and it is explained that the only protection is faith. This reaches a crescendo in verse 12 where we are faced with the Word of God in the form of a sword capable not just of destroying our bodies but our very souls. This sword will discern the true nature of our faith and we will be placed naked before God. Verses 14-15 return the focus to Jesus Christ, the Son of God, who has passed these terrible obstacles and "passed into the heavens". Now we have "entering his rest" being identified as "passing into the heavens". Christ having made this journey already faced all aspects of the ordeal we face but came through without sin, something no one has ever done. The text then returns suddenly to the symbols of the Jerusalem Temple by encouraging the initiate to approach the "throne of Grace [to] obtain mercy". This seems a clear reference to the Ark of the Covenant, the top of which was referred to as the mercy seat and represented the throne of God, protected by symbols of the Cherubim. In Hebrews 5 the author again turns to describing the role of Christ as High Priest. He contrasts Christ with the Aaronic order of high priest in the Jerusalem Temple and establishes him as a Melchisedec order High priest that is superior. In verse 9 the text indicates he has been "made perfect" (τελειωθεὶς teleiōtheis). Then in explaining this order of Melchisedec the author hedges and in verse 11 indicates that these are complicated doctrines that are not easily explained and his audience is not all that good at listening. They are looking for teachers of the "first principles of the oracles of God" and this teaching is going to go beyond that. The author states that "strong meat belongs to them that are teleiōn [who can] discern good and evil". So again making clear these teachings are for initiates. This thought continues in 6:1 where the author says he is leaving the archēs about Christ and moving on to the teleiotēta which KJV renders "perfection" but probably has more the sense of ritual initiatory teachings. The text then explains what it will not cover are the foundation of the basic Christian doctrines. Then the author follows up with stern warnings for those who have tasted (perhaps a reference to the tree of life or the forbidden fruit) who then fall away. This is followed by encouragement in verse 11 for those who have "diligence unto the full assurance of hope unto the telous". Verse 12 assures us that "faith" and "patience" will allow us to "inherit the promises". It is then explained that these promises belonged to Abraham, particularly referencing the promise of progeny. Some discussion then follows reviewing scriptures and indicating that these promises hinge on oaths of the most serious nature. Then in verse 19 the author returns to explicit temple imagery assuring us that we have been properly equipped so that we may be "sure and steadfast" and enter within the veil. The text indicates Jesus has already entered through the veil and ties this to his status as a Melchisedec high priest. This brings us back to the imagery at the end of chapter 4 where the author referenced the mercy seat. The author now gives a bit of backstory on Melchisedec. In 7:3 he states he is "without father, without mother, without genealogy, neither archēn Of days nor telos of life". It is worth noting that Joseph amended this verse in the JST to refer to the priesthood rather than the man. The use of this word pairing strikes me as intentional although it is unclear how it relates to Jesus who is described with similar words in 2:10 and 12:2. In verse 6 we are reminded that Abraham had the promises. In contrasting the two priesthoods we learn in verse 11 that teleiōsis cannot be attained by the Levitical priesthood. This is said again in verse 19. The law [of Moses] did not "make perfect" eteleiōsen instead a "better hope" did and allowed us to "draw nigh unto God" giving us another phrase to add to our list of promises. The text then explains an oath is needed for this "better hope". This oath was unavailable to the priests of the Levitical order but was given to the Melchisedec order. The oath Jesus received is what makes this new order a "higher covenant". Jesus' power of unending life through the resurrection in verse 25 allows him to "save to the uttermost" or "to the panteles" those that "come unto God by him". A compound word of "pas" meaning complete and "telos". As is made clear in second half of this verse, Jesus having made the journey himself is now able to intercede or assist his followers who are making the journey to "come unto God". The text then explains the need for Levitical order priests to constantly repeat purification rituals, but Jesus' sacrifice was needed only once. Then in 28, in contrast to the "law", the "oath" appoints "the Son" forever, having been made perfect (teteleiōmenon). KJV decides to go with "consecrated" here in its translation. At this point in Chapter 8 the author tells us he is going to sum up. I believe this summary covers the rest of this chapter. He starts by reviewing that Christ is the high priest and that we have access to the "true tabernacle" in the heavens of which the Jerusalem Temple (or Tabernacle of Moses) is but a shadow. Christ offers gifts in this true tabernacle of which the earthly gifts offered by Levitical priests are but a shadow. He is the mediator of a "better covenant" esablished on "better promises". This new covenant is written in the minds and hearts of the people and all under the covenant are expected to "know The Lord". Chapter 9 now walks through the worldly sanctuary. The Menorah and Table of Shewbread are described that resided in the Holy Place, followed by the inner veil of the temple and the Holy of Holies with the Ark and the Cherubim. After mentioning the mercy seat the author indicates that he cannot speak specifically. It is unclear if this is referring to the mercy seat particularly, or if he is also including the Cherubim or all the furnishings he has just outlined. Starting in verse 7 he begins discussing the Yom Kippur service where the High Priest alone would be permitted to pass through the veil and enter into the presense of God in the Holy or Holies6. This is a clear parallel to the promises that have been described so far. Reference is made to the purification rituals that had to be completed before approaching the veil. These are described in scripture and early Jewish writings in great detail. They involved a series of washings, anointings, sprinkling with blood (referenced here explicitly), donning of various layers of ceremonial clothing, ceremonial transferring of sins and sacrifices (including the famous scape goat) and complex rituals of prayer. Then verses 8 and 9 the authors states that the way into the Holy of Holies was not made manifest at that time. The officiator could not be made "perfect" teleiōsai through these rituals. The inferiority of these rituals is emphasized as they depended on the blood of various animals and an imperfect earthly temple. The ritual offered by Christ involved a perfect, eternal heavenly temple and was validated by his own blood. In verse 15 the author tells us that Christ's unique position allows him to be mediator of a new covenant and give the promise "of eternal inheritance". In the Old Testament this word had the sense of a land appointment. In New Testament it seems to have the sense of a share in a heavenly kingdom. So we add yet another definition to our growing list of promises. Starting in 9:16 a new concept is introduced. To further explain the superiority of the temple ritual of Christ the sacrifice of Christ is contrasted with the sacrifice of animals. KJV renders this verse as speaking of the "testament" and "testator". A better rendering might be "covenant" and "covenant maker". Trying to make sense of this verse NIV decides it must be a metaphor for a will and renders it "In the case of a will, it is necessary to prove the death of the one who made it". This rendering seems out of place and out of context. The Greek word diathēkē is elsewhere frequently rendered covenant. The New American Standard Bible seems to do better "For where a covenant is, there must of necessity be the death of the one who made it." or the interesting rendering of Young's Literal Translation "where a covenant is, the death of the covenant-victim to come in is necessary". It is a common cultural pattern that the maker of a covenant must offer up his own life. As many find this impractical, a substitute is usually found, sometimes in the form of an animal, sometimes in the form of a more expendable person. With this in mind it compares the force of the Mosaic covenant which was sealed with the blood of animals to the New Covenant which was sealed with Christ's own blood and his unique status of not requiring a substitute yet still continuing to live. He is contrasted in verses 25-26 with the Levitical high priest who entered the earthly Holy of Holies with "the blood of others" whereas Christ, once in the synteleia (compound of syn "with" and teleō) of the age (KJV renders "end of the world" but this is not accurate) cleanses sin by "the sacrifice of himself". In verse 28 the proxy nature of this sacrifice is again confirmed. In 10:1 the author asserts that because the Jerusalem Temple is but a shadow and not the true temple itself, it cannot make those who "draw near" "perfect" teleiōsai, noting in verse 4 that animal blood cannot take away sin. In verse 10 we are told that we are sanctified by the body of Christ one time, rather than the continual offerings in the Jerusalem Temple. Sanctified here refers to the preparatory cleansing ordinances required before entering holy precincts, Christ's blood being similar in function, yet superior, to the blood of the sacrifices in the Levitical order. Then in verse 14 the text states that through that one sacrifice those who have been "sanctified" have now been teteleiōken. 10:15 starts in the Greek with an important verb Μαρτυρεῖ Martyrei, from which we get the word martyr and which means testify. This is not the first use of this word in Hebrews. Significantly it was also used in 7:17 where God "testified" of the Melchisedec Priesthood of Jesus. But in this passage it starts a theme that will be continued through the next chapter appearing 5 times including in our focus verses. Unfortunately, this recurrence is mostly lost in translation. 11:2 and 11:39 stand as bookends of that section. Both use this same verb which KJV renders "obtained a good report" but could more accurately be rendered "gained a testimony". It is also used twice in 11:4 and also in 11:5. This appearance in 10:15 offers a definition of this term, given in 16-17, that is being referenced through the next chapter when the verb is used. The "testimony" from the Holy Ghost refers to the New Covenant written in hearts and minds and the purging of sins. The obtaining of this covenant and the cleansing of sins through the blood of Christ prepares the initiate to approach the veil and enter the Holy of Holies (verse 19). Verse 20 indicates a New and Living way that has been opened to pass through the veil. Living is in contrast to the "dead" way used previously that required the blood of animals. This new way is "living" as Christ although sacrificing his blood continues to live. This is the way that in 9:8 the author stated was not made manifest previously. Now with the blood of Christ available an initiate can be fully prepared to pass through the true veil in the Temple in Heaven, of which the Jerusalem Temple and its veil ceremony were but a shadow. Verse 21 continues this theme, again referencing Christ's role as High Priest over the "house of God", another name for the temple. In 22 we are told to "draw near" meaning to approach the veil with a "true heart" and a "full assurance of faith". References are made to the preparatory ordinances of sprinkling with blood and washing that have prepared us for this point. Starting in verse 23 the author again returns to the theme of the ordeal, a terrifying aspect that must be overcome. In many initiation rituals that include the passage of an ordeal a talisman of some kind is needed to overcome the dangers, a magic flute or a special clothing or powerful phrase. In Hebrews the needed element throughout is "faith" sometimes coupled with "patience". Here in 23 begins an encouragement toward the ordeal of approaching the veil as we are told to "hold fast to the profession of our faith without wavering". It follows it up with a reminder of the promises and noting that the giver of those promises had faith. Interestingly in 24-25 the first mention is made of the team effort involved in the ordeal. Up to this point the focus has been on the lone High Priest preparing himself to pass through the veil, but now the author speaks for the first time of helping one another and the sense that we are approaching the Holy of Holies as a company. But then starting in 26 the terrifying aspects are again described. We are threatened with "fiery indignation", a much "sorer punishment" than "death without mercy", and "vengeance". Again reaching the crescendo of verse 31 "It is a fearful thing to fall in the hands of the living God." The ray of hope breaks in again starting in 32 as the author reminds the candidates that they have endured terrible things before after they were "illuminated" and points thier minds to the destination of heaven as the prize that justifies the ordeal. The thought is wrapped up in 36-37 as the initiate is admonished to have "patience" to receive the promise. The theme returns then in 38 as we are cautioned to "live by faith" and warns of "drawing back unto perdition". Now having established firmly the theme of the ordeal by the initiates as they approach the veil, the author launches into the most famous discourse on faith. It is essential to understand the context leading up to this point. The text has walked us through the workings of the Levitical temple and the function of the High Priest. He has established the superiority of the Melchisedec order brought by Christ. He has established that the Jerusalem Temple is an earthly reflection of the Heavenly Temple and that although the High Priest could pass the veil on this earthly building, the way through the veil in the true temple had not yet been revealed. Christ opened that way which is now available for the first time to these early Christians who have been invited to come through the veil where they will receive the promises that have been defined throughout the text. As they draw near they will need faith to receive a testimony to get them past the ordeal so they may be made perfect or teleios. This entire lecture on faith then should be understood in that context. Chapter 11 begins with a definition of faith followed by a declaration that it was the means by which the elders (Old Testament saints) received a testimony emartyrēthēsan. 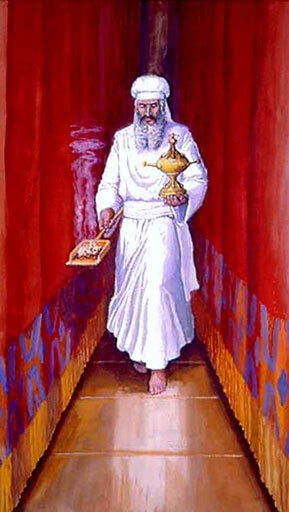 A long list of faith examples follows in basic chronological order starting with creation and moving on to Able who in the Biblical text offers the first sacrifice by which he gained a testimony emartyrēthē followed by God testifying martyrountos of gifts that he would be able to speak even after death. This is a clear reference to his "blood crying from the ground" as the first martyr, a concept deeply tied to sacrifice and the themes discussed thus far in the text. Enoch's victory over death is also attributed to his testimony memartyrētai. In 6 we are again reminded of the need for faith for those that "comes to God". After Noah, Abraham is mentioned with his grant of "inheritance" reflecting the land portion of the promises as well as the passing of the promises to the other patriarchs. This land promise is then tied in 10 to the concept of the heavenly city or Sion. Then 11-12 tie the Abraham story to promise of progeny. So back in 10:36 we were admonished to patience and told that after we had done the will of God we would receive the fulfillment of the promise. Now using that same verb we now in 11:13 indicate that the elders died not having the fulfillment of the promises. We are told they have seen them afar off, in some variants of the text including the one used by KJV we are told they were persuaded, and welcomed them. This verse is one of the clearest in explaining the difficulties of our focus verses. Promises are such that they include becoming worthy of them, have them sworn to us with oaths, and then finally fulfilled. The actual fulfillment of the promises was not made during the lives of the elders although they were assured of them. Having established this the author returns to defining those aspects of the promises tied to inheritance of land by pointing out that those who had welcomed the promises no longer belonged to this world but sought something better. In verses 14-16 we are told they seek a "better country" where God has prepared a city. This parallels other concepts in Hebrews where a heavenly reality is held as superior to the earthly reflection. The text then follows the passage of blessings through several generations of time through the patriarchs and Moses. After recounting the great miracles of faith with specific leaders in scripture, the text then reminds of the nameless saints who have made equal sacrifices in verse 35-38. The author gives a notable place to nameless women as well as martyrs. Finally this brings us to our focus verses. Speaking of this long list of Old Testament saints both famous and nameless, we are told they had received a testimony martyrēthenes through faith, the one thing that could see them through the ordeal, but did not receive the fulfillment of the promise. God for us [the initiates] had planned something better, such that these ancient saints would not reach perfection teleiōthōsin without us [the saints of Christ's generation]. Only together with these future generations was it possible for these ancients saints be able to reach teleos. Only after Christ had revealed the way through the heavenly veil could the fulfillment of the promises be made. I should note that Joseph Smith in the JST tell us that only through their sufferings could they reach perfection, placing the emphasis on the ordeal as a requirement for reaching that final state. In chapter 12 we pick up with telling the initiates that they are surrounded by a "cloud" of witnesses martyrōn giving a striking visual of a great company of those who have testimonies from all generations of time assisting the initiates through the ordeal, giving courage to lay aside sin and "run with patience the race". The author then brings in our greatest helper in verse 2, Jesus the archēgon and teleiōten of our faith (reflecting 2:10), who understanding the "joy" of the promises was able to endure the cross and now sits enthroned with God. The author then steels the initiates to "resist unto blood" against sin and places the chastening of the Lord as a requirement for adoption as a son and promises that faithful endurance of the ordeal will allow us to be "partakers of holiness" in verse 10 and the "peaceable fruit of righteousness" in verse 11 (reflecting back to the references to tasting earlier in 6:5). Verses 12-14 then encourages the initiates to assist each other and explains that this is required to "see the Lord". It warns in 16 the dangers of selling the sacred birthright that has been entrusted. In verses 18-24 the author warns that they have not come to the fiery slopes of Mount Sinai that our ancestors and even Moses feared but to an even more fierce place, Mount Sion. This heavenly city includes "an innumerable company of angels," the "general assembly and church of the Firstborn," "God," and the "spirits of just men made perfect teteleiōmenōn" establishing the residents in holiest spot of this heavenly temple, the author then states Jesus role in providing the cleansing blood that speaks better than Able's (referencing again the blood crying from the ground). In verse 25 we are cautioned as it is the very blood of Christ that speaks we must be sure not to refuse. This speech with be greater than the thunderous voice at Sinai that shook the earth, for it will shake heaven as well. The chapter ends in the rapturous exclaim "For our God is a consuming fire!" It is my assertion that this text is intended to explain to early Christians their own developing body of ritual. With the loss of temple access the early Christians developed a body of ritual reflecting and modifying the Jewish temple cult. While the early Christians appear to not have had the means of establishing their own temple, it does appear they developed a system of temple ritual that was considered a deeply private teaching for faithful initiates and probably corresponded with other mystery initiations. I think that by close analysis of Hebrews it is possible to see the outlines of such a system as ancient temple symbols are reinterpreted in light of Christian doctrines. The word teleiōthōsin interpreted as fully initiated into the ordinances is very illuminating to the remainder of the text. I know sometimes Hebrews is pointed to as an explanation as to why Christians in general don't use a temple any longer. Is it believed, then, that the early Christians actually performed these rites and did they have some kind of sacred space set apart for it? Or perhaps just in regular private places. This is also the first time I have thought about the ordeal. I can kinda see that in the lds ordinances but I have never thought about it as such. Its interesting to think about how that might relate to what we're doing in modern times. Its seen as a test to remain true and faithful in spite of false doctrine. I think most historians LDS or not would agree that early Christians developed a complex set of ritual beyond baptism and laying on hands. It is generally acknowledged that this included esoteric teaching from scripture, oath taking as well as ritual reenactment of important concepts. Some of these concepts grew into Gnosticism such as the Nag Hamadi Library or can be seen in other early Christian writings such the forty day literature. It does not as far as I can tell, seem like the early Christians were able to build a temple. Certainly they were widely dispersed which is part of what led to the fragmentation of Christian belief. A temple and a central cult might have done much to keep Christianity unified, something that the Popes succeeded with after they came to power in the forth century. LDS temple practices also originated outside of temples and remained in use in certain private settings during the early periods of the Church. It is my belief that early Christians followed a similar pattern. I would enjoy sharing thoughts on how the ordeal relates to LDS worship but such a conversation would have to be in another time and place. Thanks for sharing your thoughts.